To enjoy high-end gaming experiences and revolutionary technologies such as virtual reality, great graphics are vital. 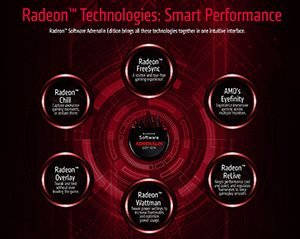 AMD’s Radeon™ graphics products offer an array of benefits to gamers of all budgets and needs. Join Bryan Kong, AMD’s Product Marketing Engineer on November 8th, to see a closer look at how AMD Radeon™ Graphics help bring gaming to life. AMD is on track to deliver the most advanced PC processor technology with a 7nm breakthrough enabling the industry’s best solutions for gamers, streamers, enthusiasts, content creators, and professionals. AMD continues to set the pace of innovation to offer your customers more choice, with a powerful line-up of desktop processors using the scalable, future-ready AM4 platform. AMD Ryzen™ processors. Don’t get ripped to threads without it. Download the packaging info sheet, a reference guide for details on box dimensions, weight, and more. Includes packaging standards for all AMD processors currently in the Channel, including AMD Threadripper™ and Athlon™ processors. Make sure that you have the latest Channel Partner resources! Bookmark amd.com/partner and visit often for the newest AMD product trainings, webinars, marketing materials, sales tools and other resources. ©2018 Advanced Micro Devices, Inc. All rights reserved. AMD, the AMD Arrow logo, Athlon, Radeon, Ryzen and combinations thereof are trademarks of Advanced Micro Devices, Inc. Other product names used in this publication are for identification purposes only and may be trademarks of their respective companies. Pentium is a trademark of Intel Corporation or its subsidiaries in the US and/or other countries.